This formula converts the Stochastic outputs to the price scale of the chart to create an overlay of the Stochastic where the study shares the same y-axis as price. 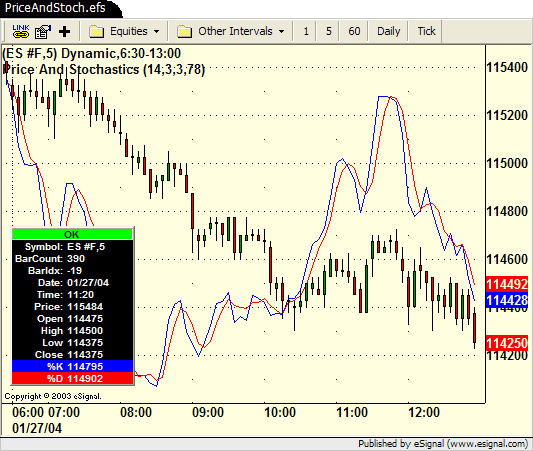 This creates a fixed, or scaled, relationship between the price and the Stochastic study. The â€œLength for Scalingâ€� parameter determines the conversion factor for the Stochastic outputs. The basic rule of thumb here is to enter a number equal to the number of visible bars in your chart. //define price scale from Highest High and Lowest Low from the last nScaleLength bars.